The parts for the telescope have arrived and I have to say I’m kind of excited. 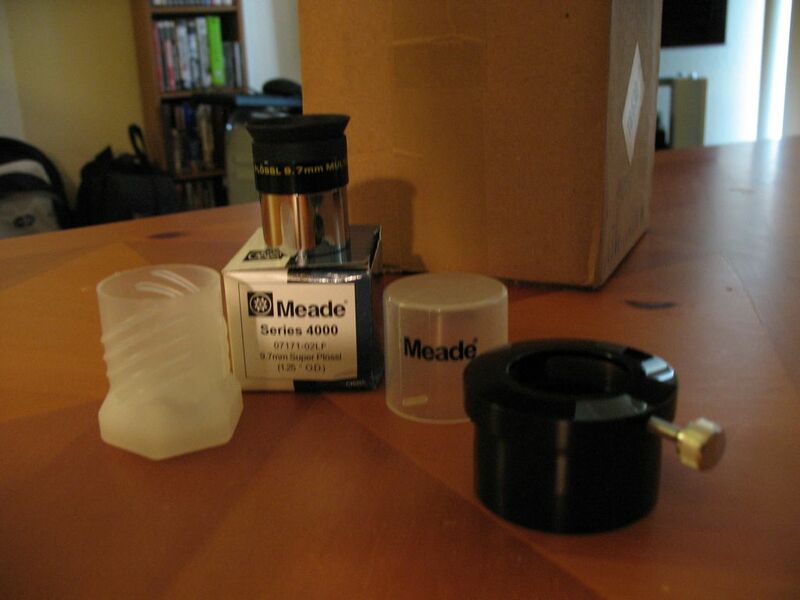 As you can see I have a Meade 4000 Super Plössl 9.7mm eyepiece and a 2″ to 1.25″ eyepiece adapter. My telescope came with a 12.5mm Huygenian eyepiece and I’m happy with the 93x magnification it produces. The 9.7mm eyepiece will create more magnified image, but really hope the resolution is better. I want to be able to see more that just one of Jupiter’s cloud bands. If anybody has ever been to Wal-Mart then you have probably seen the telescopes and musical instruments they keep next to the vision center. Well, several years ago I received one of those telescopes for Christmas. It was Meade DS114 reflective telescope with AutoStar Computer. I never used the scope much growing up, but now that I am out of college and working full time I have time to enjoy a few hobbies. One of those being astronomy. So now I have my telescope at my apartment and when the weather is good I can see some cool stuff like Saturn, Jupiter, and the Moon. The tripod is poorly supported with no bracing between the individual legs. The telescope has an AZ/ALT base meaning it swivels left/right and up/down. 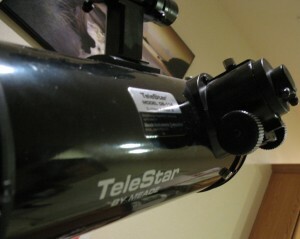 Great for easily moving and find stuff, but hard to track nighttime objects. No manual control. The base of the telescope is designed to be used with the Meade AutoStar computer. It takes care of all the object tracking. Only 0.965″ eyepieces are accepted. Higher quality telescopes accept the standard 1.25” eyepieces. So what to do? A new telescope would cost at least $400-$500 dollars and that is something I’m not ready to commit to. Instead I think I can improve the current scope I have and get in a position to have better equipment for the future. How? Replace the one piece that is easiest: the eyepieces. Switching to better eyepieces should, in my theory, improve the image quality of my telescope and allow me to see more detail. The only problem is my eyepiece mount only accepts 0.965″ eyepieces. Meade was nice enough to provide a 2” adapter ring with the telescope so I can use 2” eyepieces. Though the 2” eyepieces are more common, they can be considerably more expensive and therefore are still not ideal. The plan? Install the 2” adapter ring into my telescope and then use a 2″ to 1.25″ adapter. That should allow me to use eyepieces like the Meade 4000 Super Plössl series. In the coming day’s I’ll see if my gamble to buy adapters and new eyepieces pays off.